WTAY knows that operating, managing, and/or working for a wilderness tourism business can be challenging--so we want to help! Below is a list of resources that we think are relevant for ensuring a safe, respectful, and exciting wilderness experience for you and your clients. Clicking on an item will bring you to a new page with additional information. If you know of a resource that might benefit your fellow industry members, please feel free to contact the office and we will add it to the list. WTAY has developed a comprehensive package of information that outlines requirements for Yukon based wilderness tourism companies that are planning to operate outside of the Territory. This information is specific to B.C., Northwest Territories, Canada's National Parks and Alaska. Please contact the WTAY office at 668-3369 or info@wtay.com if you would like to receive this document. This information is only available to current WTAY members. 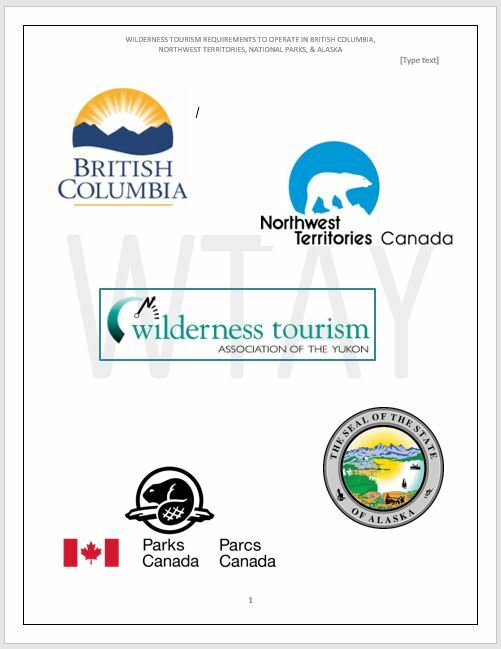 WTAY has developed an extensive document that outlines a variety of funding sources available to WTAY members. These funds are largely government programs and provide monies for marketing & advertising, student employment, university co-op & mentorship programs, employee and owner training, business development, First Nations projects and more. Details include a brief outline of the fund, who manages it, web links and contact details. Any member wishing to further develop their business, expand their capabilities, that requires employee training, who wants to access the skills and education of university students or wishes to develop a First Nations project will find this document useful. The document is only available to specific WTAY members (Full members and Affiliate members) and can be obtained by requesting it from the office. The YFNCT website is an excellent source for cultural and interpretive centres, festivals, attractions, experiences, and art. Information and links for First Nation governments, contacts, traditional territories and languages.